Remember Me? by Sophie Kinsella is definitely loads of fun! Although it exceeds the average length at about 430 pages, the book is so fast-paced that people enjoying themselves will breeze right through it and not realize it. Remember Me? is the story of Lexi Smart, who in 2004 is a nerdy loser with bad hair, ugly teeth, a depressing job, and a lame boyfriend. One night out while drinking with her friends, she trips down some stairs, hits her head on the pavement, and walks up in the hospital. Only she finds herself waking up in 2007; with beautiful hair, fixed teeth, a job high up on the corporate ladder, and a handsome, rich husband! Although it seems like the most picture-perfect scenario, Lexi hits snags along the way as she discovers what her life is REALLY all about, because she definitely has secrets. Kinsella made the book highly contagious in terms of being enjoyable because as she writes up Lexi's new life, we find ourselves all relating to things we want to happen. For example, in Lexi's "new" life, she is able to do power-yoga and can walk perfectly in high heels whereas she wasn't able to before. How many times have we wanted to wake up with new super powers, including having our physical flaws fixed? Jon is Lexi's husband's architect, and I absolutely fell in love with his character. Most of his dialogue made me laugh out loud, especially the moments where he poked fun at Eric, Lexi's husband. Jon is definitely one of the biggest draws to the book's plot. Overall, I really loved Remember Me? and reading it was immensely fun! Must be an enjoyable read Remember Me? 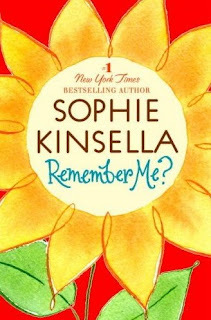 : A Novel by Sophie Kinsella. loved the way you wrote it. I find your review very genuine and orignal, this book is going in by "to read" list.